Born in Milton, Pennsylvania, on Dec. 1, 1855 to William Theodore Wylie and his wife Sarah Murray Johnson Wylie, Laura Johnson Wylie spent her childhood on the move, learning from her father and caring for a growing collection of half-siblings. When she entered Vassar as a freshman she was far behind her fellow classmates, later admitting that she hadn't been able to spell and that she knew almost nothing about geography. She quickly caught up, graduating in 1877 as valedictorian of her 45-person class. Her fellow students remembered her as a voracious reader, constantly in the Library with a book. "All through her life," remembered Elisabeth Woodbridge Morris, "in her contacts with books, she had this amazing swiftness of pace, coupled with a complete grasp of essential content, which is characteristic of the finest kind of scholar mind. And she read everything: biography, history, economics, novels, poetry, essays, philosophy, psychology, aesthetics – all was grist for her mill, and this with never a trace of pedantry – no pride in acquisition for acquisition's sake, or in power for power's sake. All was enjoyed, all was used, all bore fruit in richer thinking and doing, and the fruit bore seeds for fresh fruit." With such a love of the written word, it was no surprise to those who knew her that Miss Wylie became one of the first women admitted to graduate courses at Yale, where she wrote a thesis on "Sources of English Criticism," the first thesis by a woman that Yale published. 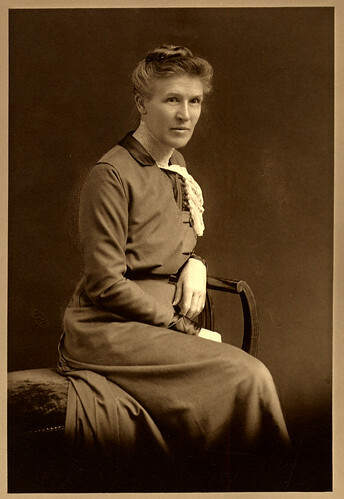 While earning her Ph.D., Miss Wylie taught at private secondary schools. A member of the first group of women to receive, in 1894, the Yale Ph D, she returned to Vassar in 1895 as an English instructor. Within two years, she had risen to chair of the English Department, a position she kept until 1921. As chair, Miss Wylie sought to reform the department along the lines of her unique philosophy of teaching. Katherine Warner wrote in the Vassar Quarterly in 1924 that Miss Wylie thought of English as "a single territory of art and scholarship, the 'branches' of which were not separate, but were merely different aspects or approaches, emphasizing one or another element without detaching it from the rest. From this it inevitably followed that the department itself should be an organic whole in the main trend and character of its teaching, not an agglomeration of persons with alien ideas, teaching on tangential lines." She shifted the focus of courses from a primarily literature based curriculum to classes that emphasized writing and developing a cohesive style of expression. Freshmen work was especially crucial to Miss Wylie's new take on teaching English. She made sure the best teachers worked with the freshmen alongside the new teachers. The freshmen work was primarily creative instead of logical and mechanical – the idea was to foster a living sense of literature and writing. Department meetings increased under Miss Wylie's leadership and became forums for free discussion and collaboration on new experiments. The year of her retirement, her impact was most visible in an experimental course for seniors planning to go to graduate school – "a course consisting of lectures given by different members of the department, and having no correlation beyond the assignment of general subjects, each instructor offering what seemed most likely to be helpful in the field on which she was qualified to speak. After the end of the course," said Warner, "one of the ablest of the class said to a lecturer that it had clarified and confirmed an impression which had been forming dimly in her mind, in going from teacher to teacher, throughout her English work: that no matter how divergent their subjects or methods or their peculiar contributions, there was something common to them all, - some informing spirit or principle which belonged not so much to themselves as the the department as a whole." Many would say that Miss Wylie was the personification of that spirit. Miss Wylie and her partner, Vassar Professor Gertrude Buck, welcomed students to their home every Thursday afternoon to play with Miss Wylie's beloved dogs and talk about classes, politics, and life in general. Miss Wylie was well known as a social being, often seen laughing with her students in the halls of Rocky or having intimate discussions in her office. The Miscellany Monthly said, "Her students feel a keenly sympathetic response to all their problems, whether of a personal or an academic nature, - whether they are of a personal or an academic nature, - whether they are sent to bed or to the library. And while she storms at them, upon occasion, with unmodified frankness, it is frankness that carries no sting." Mary Conger Vanamee said, "Miss Wylie's genius was to make mediocrity articulate and to winnow away the dross. She was interested in the poets. She had the divine humanity to be more interested in us, in our floundering, dull little minds, in our possibilities. Many educators do this for a few, for their really promising young people. Miss Wylie had the rare ability to do this for the many, nor to grow bored by their numbers." Beyond the classroom, Miss Wylie's contributions were no less influential. One of her students, Elizabeth Johnson '02, remembered Miss Wylie well: "Known throughout the east as an inspired teacher with the eternal enthusiasm of youth, Professor Wylie was not a remote academic type but a woman who bridged the gap between campus and town with myriad activities." At her death, newspapers throughout the region recognized her as the leader of the local suffrage movement. She founded the Equal Suffrage League with two other Vassar professors in 1909, and stayed deeply connected with the organization throughout her life. After the vote was won, the League became the Women's City and County Club – a group that conducted civic classes year round for women and boasted many Vassar professors as its members. Miss Wylie served as president of the club until 1928, at which point she was named honorary president, a position she kept until her death in 1932. She also served on the board of the Poughkeepsie Community Theatre, which was founded by her partner, Gertrude Buck. "As Laura Wylie was a natural Commander, so her friend Gertrude Buck was aristocratic in her standards of art and in her own sensitive nature," said President MacCracken, "Yet the two teachers and friends professed and practiced a broad social philosophy. Their home on Market Street in the center of old Poughkeepsie became a rallying place for suffrage and for many other movements. The social interpretation of literature which these teachers conveyed in their classes at Vassar, was the outgrowth of their daily living in the community of this Hudson River town. With Miss Wylie's tremendous fervor and Miss Buck's fastidious standards, this success in their association with townsfolk would not have been predicted, yet it was immediate and constant in growth. Both of them left behind them enterprises of value which bid fair to be permanent assets in the neighborhood." Miss Laura Wylie died on April 2, 1932, but she continued to influence the progressive community in Poughkeepsie. She left $10,000 to Vassar for town-gown relations, earmarked specifically to sustain Gertrude Buck's community theater. The home she had shared with Miss Buck was left to a trust that allowed the Women's Club to use it rent-free for six months, and after the six months, the Club bought the home outright to use as a headquarters. Today 112 Market Street still houses a progressive organization – the environmental organization, Hudson Sloop Clearwater. Friends of Miss Wylie banded together to publish a collection of memorial essays in 1934, "Miss Wylie of Vassar." The book is a testament to Miss Wylie's dedication to teaching and to humanity. Eleanor Roosevelt's contribution at the end of the collection sums up the impact Miss Wylie had on the campus and community at large: "Those of us who knew her will miss her always but her influence will live down through the years as long as we who remember her find ourselves unconsciously living up to her ideals and enthusiasms." Biographical File. Laura J. Wylie. Vassar College Special Collections (VCSC). Laura J. Wylie Collection. Box 4 of 7. (VCSC). Miss Wylie of Vassar edited by Elizabeth Woodbridge Morris. Vassar College Library.